I am raising funds for three charities:Cancer Research UK, Maggie's Centres and MacMillan Cancer Support in memory of Ellie MacDonald who recently died of cancer at the age of just 23 and lived on the croft next door to me on North Uist in the Outer Hebrides. The Hebrides is a beautiful wild place and somewhere I go for inspiration to paint, fish, dive and kitesurf. Ellie loved the outdoors, and getting out on the sea, visiting the Monach Isles, 5 miles off the west coast of North Uist opposite her home croft. The Monachs has one of the largest Grey Seal colonies in the world. I was inspired to take up the challenge for '1 Million Miles for Ellie' some of these miles will be on the stretch of beautiful Atlantic Ocean Ellie knew well. I had often thought about the possibility of kitesurfing there, and last summer I managed the crossing twice, a big thank to everyone who helped to make this happen and sponsored me, it was the first time that it had ever been done! 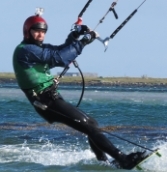 Kitesurfing to St Kilda was my aim this summer to carry on '1 Million Miles for Ellie', six times further out into the Atlantic to the Monach Isles and a much bigger challenge. I was on North Uist from early June hoping for the right weather conditions. The first ever St Kilda Yacht Race took place then but the winds were too light for me to attempt a crossing. Back on North Uist for August and a small weather window meant I attempted the first crossing at 6am on 20th August from Balranald Beach. Unfortunately, after making good speed for an hour and forty minutes and 20 miles out (half way across) the wind dropped and my kite came out of the sky - I was becalmed! After an hour of trying to launch the kite, whilst being in contact with the Coastguard in Stornoway who had alerted shipping in the area, St Kilda Cruises in their boat 'Hirta', who were on route to St Kilda, diverted and rescued me. The crew of Hirta were a truely professional outfit and I cannot thank them enough (and highly recommend St Kilda Cruises for anyone wishing to visit St Kilda). I spent a special day with them and was very grateful to them for giving me a lift back Berneray where I arrived back early evening. Many thanks also to National Trust for Scotland and Quinetc at the MOD base who looked after me on my arrival at St Kilda. I still had time for a magical three hours of hiking on the island, which never fails to amaze me. There is simply no where in the world like this volcanic archipelago of remote islands. With all the experience I have gained and more training, I hope to make another attempt next summer on the crossing, all the way next time by wind power (and a safety boat just in case the wind drops)! Through Virgin Money Giving, you can find out more about my challenge or sponsor me - donations will be quickly processed and passed to the nominated charities. Virgin Money Giving is a not for profit organisation and will claim gift aid on a charity's behalf where the donor is eligible for this.